There I was, sat comfortably in the garden, and just preparing myself to get the lawn mower out. The grass hasn’t been cut for several weeks and the grass is getting long, the clover has grown but the flower is about to go over. But then I heard it …. chirrup …. 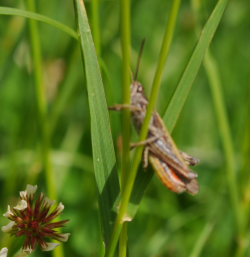 chirrup … a grasshopper! And then there was a reply from up the garden. Looking carefully I spotted it in the grass, grabbed my camera and took this shot. It’s not quite in focus but it’s proof! Later I heard more chirruping from up the garden, so the grass is going to grow a little longer. This entry was posted in Environment, Garden and tagged Grasshopper. Bookmark the permalink.